Welcome to Jacob Hoffman-Andrews' c2c weblog. I rode my bicycle from Cape Cod to California between June 15th and September 29th, 2003, and kept this online journal along the way. I started with my friend Emily in Provincetown, Massachusetts. 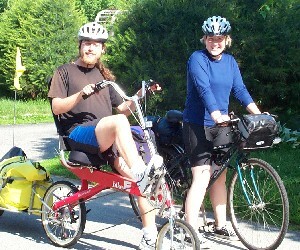 We rode together through New York City and Cleveland to Chicago, where Emily left to go on vacation with her family. After a brief interlude while I flew to California for job interviews, I continued alone from Chicago and travelled through Omaha, Denver, Salt Lake City, and Las Vegas (by way of the Grand Canyon) on my way to San Francisco. I arrived in the City by the Bay on Saturday, September 27th, rode to Mountain View on Sunday, and started work at Google on Monday the 29th.